A steamboat river cruise in the Northwest along the route Lewis and Clark traveled more than 200 years ago? Two weeks exploring Rome’s historic treasures and driving along the picturesque Amalfi coast? A train trip through the Canadian Rockies? They all sound like great getaways, and they might just be great for your health too. While some prefer road trips and campers and others, all-inclusive resorts and cruises, most of us love to travel. A vacation breaks us away from the daily routine of work, grocery shopping, cooking and the like. New surroundings, experiences and people boost our mood and help us unwind, according to experts such as Dr. Margaret J. King, the director of the Center for Cultural Studies & Analysis, a think tank focused on the ideas, products and ideas that drive consumer decisions. 'There are lots of psychological benefits from change of venue from home and work to 'third places' devoted to just experiencing the environment. With a short list of activities each day, freed up from the complexities of ongoing projects and relationships, the mind can reset, as does the body, with stress relief the main outcome. Humans thrive on novelty, and travel offers the complete package with new faces, sounds and sights," she says. We are more likely to engage in conversations with strangers, whether it’s in a pub or on a bus, and these social interactions bring joy. We can unplug from computers, phone calls, texts, Facebook, news feeds and the like, and be present to our surroundings, which is always good for one’s mood. Travel can also be good for our physical health. Instead of sitting in front of a computer or reading a book for hours, we might spend the afternoon hiking through a national park, visiting a museum or walking through Disney World with grandchildren. We are free to sleep later and take naps by the beach. Not that most of us need an excuse to plan a vacation, but knowing that it might just be what the doctor orders is an added incentive. 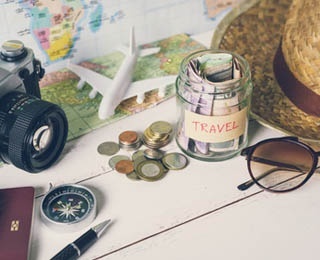 Some travelers love to plan every detail of their trip, others prefer help from experts and browse the selection of a tour group such as Road Scholar, Tauck or their college alumni office. Others mix and match, depending on the destination. Independent travel gives you freedom. You can spend an hour or the entire day visiting a museum or walking along a riverfront. You can be spontaneous and adventurous and easily change course. Of course, all this takes time and planning. A tour group also has advantages, according to Traveler’s Digest. If you have particular destination in mind, such as Alaska, talk to friends, read guidebooks and websites about solo and group tours. If you have the time and inclination, and want the best value, putting together your own vacation is often the better option. But if time is tight and stress is high, letting a tour handle all the details can be a bonus. The staff at Conde Nast Traveler recently put together 10 best travel tips of all time, most designed to save you money. The best time to book a cruise is Thursdays, and for flights it’s weekends. Best websites for flight deals are Kayak, The Flight Deal and Scott’s Cheap Flights. The best apps are TripIt, LoungeBuddy, SeatGuru, GateGuru, Google Translate and Mobile Passport. “They'll get you through every stage of your trip, from planning to flying (comfortably) to twirling cacio e pepe at a cafe down a Roman side street. Writer Kio Stark makes sure she interacts with strangers on her trips. “Talking to strangers along your travels can change your trip into an adventure. It can take you into the unknown, unexpected hearts of places and people, trading what is planned and predictable for what may turn out to be sublime,” she writes in The New York Times. Ask locals for suggestions on where to eat and what to visit, listen and be observant of people sitting next to you on the train or in a café. Of course, to make this happen follow her first rule of thumb - ditch your phone or at least stow it away.